A reader recently asked about pound nets. Some of you may remember the spirited conversation we had some time ago about the Ocracoke term "chicken pound." Off-islanders typically say "chicken yard" or "chicken pen." We use the word "pound" in the sense of an enclosure (cf. "dog pound"). Thus, a pound net is a special type of fish net arranged so as to direct fish into a pound where they become trapped, and later extracted by commercial fishermen. The first recorded evidence of Pound Net Fishing dates to the late 1500s. English explorers tell of natives using rows of sticks to "impound" fish. The Pound Net consists of three parts: a lead line, the heart and the pound. As a fish is swimming in the water it will encounter the lead line. The lead line will guide the fish to swim toward the tunnel, a passage into the pound. As the fish swims through the tunnel towards the pound the tunnel gets progressively narrower. Fish that don't enter the tunnel will swim into the heart. The heart takes advantage of the natural schooling tendency of the fish to lead them in a circle and back around to the entrance of the tunnel. Pound net fishing is a traditional method that many islanders learned from their fathers and grandfathers. It is labor intensive but on Ocracoke many favor tradition over ease. Poles 25 feet or longer are made from gum or tupelo. PVC pipe is also used but the 20 foot lengths restrict the use to shallow areas. They are jetted into the bottom until the poles are secure. Since the nets are usually set in shallow areas the tops of the poles can be seen above the water. Pound nets are not permanent. They are taken up seasonally, before storms and for maintenance. The nets are expensive and cost in the range of $10,000. Regular maintenance is critical to keep the nylon clean, free from sea growth and sediment build up. Holding the top edge of the net, it is slowly pulled into the boat so fish gather into one spot. This is called "bunting the net." The fish are brought into the boat by hand or a dip net. The catch is "culled" to keep only the legal fish, the rest are put back in water. Below is a photo of a model of a pound net made by Ocracoke native, Edward Carlson O'Neal. Click on the photo to view a larger image. The necklaces, earrings, & bracelets that the jewelry class displayed would have been welcomed in any gallery of fine handcrafts. The Ships-in-Bottles class put together intricate and detailed models of the old schooner, Windfall (created from actual pieces of the vessel), complete with black hull, red sails, and the Ocracoke lighthouse nearby. We were treated with a 16 minute computer "slide show" of the photographs captured by Ann Ehringhaus and her students. Many looked at island scenes from different and unusual perspectives. Some were haunting images...others reflective or exuberant. They were all outstanding. Our Ocracoke Sampler class shared our projects (making fig cake, meal wine, and clams casino), our adventures (sailing, clamming, and kayaking), and other activities (visiting Portsmouth Island, studying island history and nautical traditions, and making Turks head bracelets). All of our classes, together with optional hikes & meditation exercises, great food, foot-tapping music, and island stories made for a memorable week on this Outer Banks island that celebrates tradition, creativity, community, fun, and fellowship. 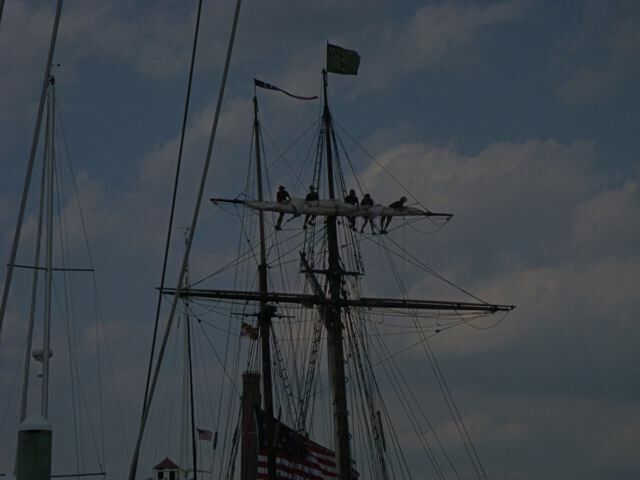 I thought some of our readers might enjoy seeing a photo of the crew of the Windfall II when we were docked in Portsmouth, Virginia after the Great Chesapeake Bay Schooner Race. And this is a photo of me when we arrived back in port in Ocracoke. I've grown a beard. I'm still letting the beard grow...but can't decide if I'll keep it indefinitely or shave it off. Only time will tell. Our Ocracoke Sampler Class (part of the 2010 OcraFolk School) left Silver Lake harbor yesterday morning at 9 o'clock aboard Donald Austin's boat. There were eleven of us -- Tom, Sandy, Kathie, Gloria, Nick, Pete, Annie, & Spencer (all students)...and Rob, Dave, & I (the instructors). Donald stopped along the way to explain the pound nets out in Pamlico Sound that are an age-old method used by commercial fishermen to catch flounder and other fish. We spent more than four hours exploring the village, including the Salter house (now used as a Visitors Center), the Post Office, the Schoolhouse (we didn't stay long there...the mosquitoes ran us off), the Methodist Church, the Gilgo house, and the US Life Saving Station. As many of our readers know, no one has lived permanently on Portsmouth Island since 1971. The buildings are now managed and maintained by the National Park Service. I only took two photos (click on them to view larger images). It was a tiring day, but everyone enjoyed our visit to one of the most unique villages in the country. Here is a typical Ocacoke Island meal wine recipe: Get a large crock, jug or clean trash can. Pour four gallons of water into the container. Add five pounds of sugar, four pounds of corn meal, three or four packages of yeast, a box of raisins, and some fruit (we used home-canned peaches, but fresh peaches, blackberries, bananas, etc. work well). You might want to strain your meal wine through cheesecloth (or an old lace curtain) to eliminate most of the ants. Fowler O'Neal always told me, with a wry smile, that if you discover a dead rat in the bottom of the container, don't just pick him up by the tail and toss him in the woods. Be sure to wring him out good first, so you don't lose any of your valuable product! Then you can toss him in the woods. The fourth annual OcraFolk School got underway Sunday evening with a dinner at the Pony Island restaurant. It was an opportunity for instructors to meet with their students. This year classes are being offered in photography, ships-in-bottles, jewelry making, cooking, and Ocracoke history & traditions. This morning the entire school enjoyed an introduction to our island. We spent from nine to noon visiting the Ocracoke Preservation Museum, the Working Watermen's exhibit, and the Ocracoke Fish House. In the afternoon students had their first chance to delve into their classes. My class, the Ocracoke Sampler students, explored graveyards on Howard Street, and searched for old cisterns and stately live oaks. We baked a delicious Ocracoke fig cake, and began brewing a crock of island "meal wine." In addition, we perused old maps of the Outer Banks, toured my story-and-a-jump house, and learned a bit about the US Life Saving Service. 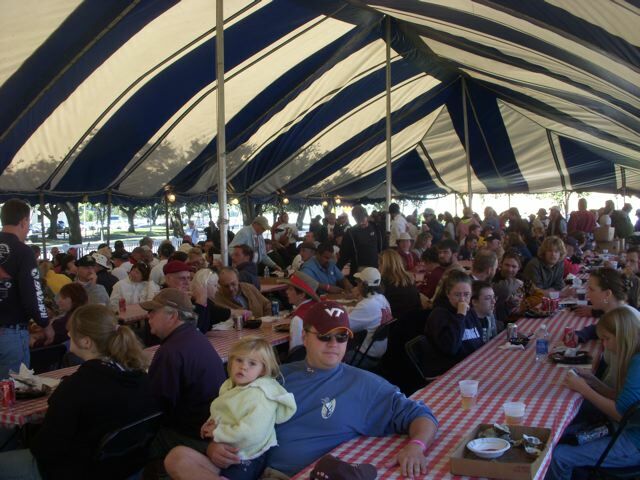 We're looking forward to several more days of study, music, entertainment, and great food. The first residential telephone service was established by Carolina Telephone on Ocracoke Island in 1956. The charge was $5.00/month. Nearly everyone in the village subscribed...and the few holdouts soon signed on as well. The telephones operated via ship-to-shore shortwave radio frequency. The tower was erected at the old Wahab Village Hotel (now Blackbeard's Lodge). A room was added to the hotel to house the equipment. In the early days private telephone transmissions could sometimes be heard by neighbors over their radios or televisions! Today our telephone service operates via microwaves. The tower and equipment building are on Cedar Road (also known as the Bank Road). When I was a youngster there was only one telephone on the island -- at the Coast Guard station. According to cousin Blanche the US Coast Guard had a ship-to-shore radio telephone as long as she can remember, probably from the construction of the village station in 1905. I have a copy of one of the earliest Ocracoke telephone directories. When I locate it I'll let our readers know how many telephones were installed on the island during the early years. "With all those elements of elegant living [beaches with romantic relics of old shipwrecks, ...eighty varieties of tropical, fresh and salt-water fish...fifteen kinds of brant, duck and geese...a few herds of wild ponies and steers...semi-tropical sunshine and weather as fine as Bermuda’s...500 friendly, geared-down North Carolinians...one phone, no law and no worries], it’s no wonder Ocracokans leave their island only on rare occasions. 'Now take my cousin,' said one old fishing guide. 'One day he went to Rodanthe – that’s fifty miles up the beach – to marry a gal, but she was out. So he married her sister. He waren’t goin’ all that way fer nothin’.'" Many of our readers will remember Capt. Rob's schooner, Windfall. 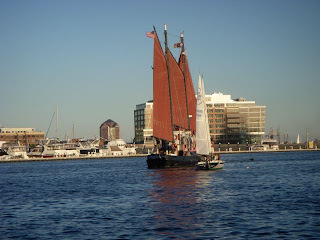 In the spring of this year the boat was dismantled, and Rob purchased another schooner, the Windfall II (this is the boat we took to the Great Chesapeake Schooner Race last week). Recently our good friend and craftsman, Jim Goodwin, made a couple of models of the Windfall that are constructed from portions of the original vessel, and mounted them in bottles. Village Craftsmen is now offering them for sale. The models are in very limited supply, and we do not know if we will be getting any more. If you would like more information, or would like to place an order, please click on the link below. Please keep in mind that only those models designated as having "wood from the schooner" were contructed from the Windfall. MANNS HARBOR — The North Carolina Department of Transportation’s Ferry Division announced this week that several runs on the Swan Quarter-Ocracoke and Cedar Island-Ocracoke routes would be suspended for several days while repairs are made to the Motor Vessel Pamlico. After examining the ferry in the shipyard, it has been determined that extensive repairs are needed in the ship’s bulkhead, stern section, aft of the engine room. It will take approximately 7-10 days to repair and have it inspected by the U.S. Coast Guard before the vessel will be ready for service. Shipyard employees will be working seven days a week to facilitate the repairs as quickly as possible. In the meantime, the three other Sound Class vessels, MV Carteret, MV Cedar Island and MV Silver Lake are continuing to make daily departures at these routes. The Ferry Division analyzed traffic figures to determine the routes with the highest traffic volume and has developed an alternate schedule for these routes beginning Friday, Oct. 22, 2010, until the winter schedule takes effect Nov. 2. The 7 a.m., 9:30 and 12:30 p.m. runs from Swan Quarter to Ocracoke. From Swan Quarter to Ocracoke departing at 9:30 a.m. and 5 p.m.
Travelers with reservations for any of the suspended runs during this time period should call the reservations center at 1-800-BY-FERRY (293-3779) and press 2 to make alternative arrangements. These routes normally return to a reduced number of departures for the winter months, which will take place beginning Nov. 2. The winter schedule can be found at the ferry website at www.ncferry.org in PDF form. The MV Pamlico was built in 1965, as was the MV Silver Lake. Both Sound Class ferries have 45 years of service within the Ferry Division’s fleet. Just recently, the N.C. Dept. of Transportation awarded a $14.9 million contract to Orange Shipbuilding Co. in Orange, Texas, to build a second Sound Class ferry with funding provided by the American Recovery and Reinvestment Act. A $13 million contract was awarded last year for the first of these two “sister” vessels, which will be completed in the summer of 2011. "[a]s is the case in many of the Banks communities, the basic source of water supply [on Ocracoke] is rain water, caught in cisterns." Recently readers asked a couple of questions re. 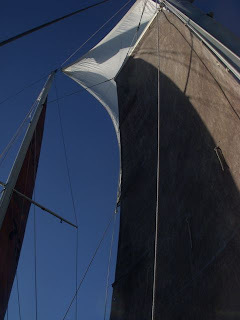 the posts I pre-wrote and scheduled for publication while I was off-island sailing aboard the Windfall II. Please read below for my replies. 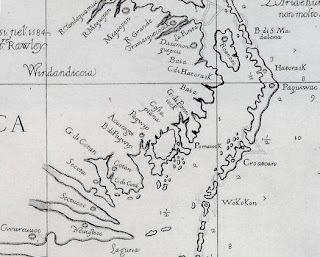 The map you posted [see http://villagecraftsmen.blogspot.com/2010/10/native-american-villages.html] begs questions about coastal NC's Native American population, specifically any original inhabitants of Ocracoke/Portsmouth Island. Any knowledge as to what became of them? First off, I think I may have intended to include a comentary on the map, but neglected to do so. 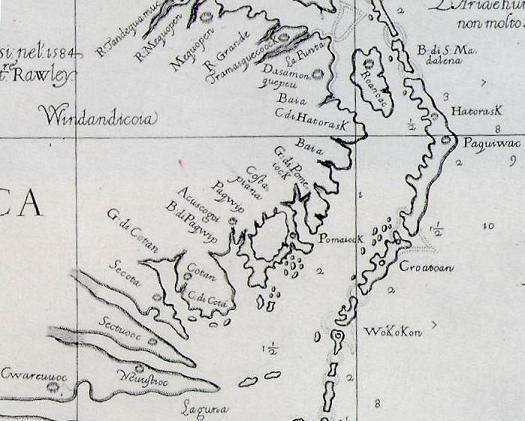 "Ocracoke" is clearly a native American name (early maps list the island as "Wococon," and over the years the name changed frequently until it eventually became "Ocracoke"). 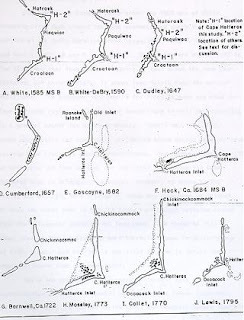 There is evidence that members of the Wocon Indians frequented the island to feast on fish and other seafood, but to date no evidence of a permanent settlement has ever been discovered on Ocracoke. In contrast, a number of Indian villages have been found on Hatteras Island, including one near Buxton in an area that in the 1500s and 1600s was a separate island (Croatoan) between Hatteras and Ocracoke (see http://villagecraftsmen.blogspot.com/2010/10/changing-coastline.html). There is some evidence that native Americans interbred and intermarried with the earliest Europeans on both Hatteras and Ocracoke. According to oral tradition, David O'Neal, the cook aboard the John Evangelist which wrecked on Hatteras Island in 1586, married an Indian woman, Morning Dew, from the village of Kinnakeet (now, Avon). The ship's captain, Caleb Williams, and another sailor, Elijah Scarborough, also married Indian women. O'Neal, Williams, and Scarborough are all long time island surnames. I found it [comments on the US Life Saving Service; see http://villagecraftsmen.blogspot.com/2010/10/monkeys-fist.html] interestiing. What was the source? I would like to know more about our brave ancestors. Two excellent books about the US Life Saving Service are Ship Ashore: The U.S. Lifesavers of Coastal North Carolina by Joe A. Mobley, and U.S. Life-Saving Service: Heroes, Rescues and Architecture of the Early Coast Guard by Ralph Shanks and Wick York. 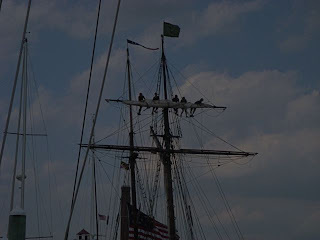 My two weeks aboard the schooner Windfall II (with Captain Rob, Emmet Temple, Frank Phelps & Steve Musil), were, at times, relaxing, challenging, exciting, great fun, dramatic, and truly awesome. Captain Rob and I pulled into Silver Lake harbor yesterday at noon after more than five hours plowing through 2-3 foot waves in Pamlico Sound. It was a wonderful adventure...and it was good to see the lighthouse from several miles away, and then to walk down Howard Street to my little cottage in the village. Over the course of the last 14 days we crossed Pamlico Sound twice, motored through the Great Dismal Swamp, marveled at spectacular sunrises & sunsets, watched bald eagles soar overhead, sailed into Baltimore harbor, listened to sea shanties on the docks, raced down the Great Chesapeake Bay, were battered by gale force winds and six foot waves (at times the port side gunnel was under water), feasted on oysters and barbeque, shared stories & jokes, and learned what our vessel and crew were capable of. I didn't have a camera, but Frank has been gracious enough to send me a few photos. I hope you enjoy a glimpse into our adventure. Click on any photo to view a larger image. Even though it sometimes seems as if Ocracoke is a world unto itself, it is not. 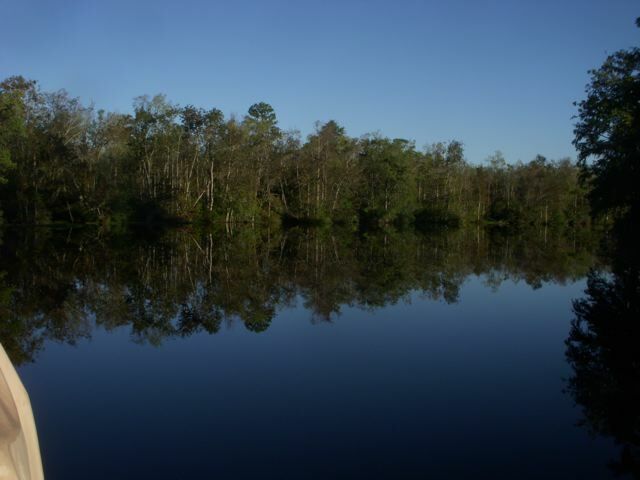 We are part of Hyde County, NC in which there is not a single incorporated community. We are governed by a 5 member Board of Commissioners one of whom lives on Ocracoke Island. The Board is meeting today (Mon. Oct. 18) at 3:30 in Swan Quarter to discuss its Review Committee's report on the funding and level of Emergency Services (EMS) in Hyde County. Ocracokers can watch the meeting via video conferencing in the Information Highway Room Area of Ocracoke School. There will be no public input at this meeting, however there is opportunity for public comments on this and any other subject at the regular meeting to follow at 7:00 (in the Commons Room at the school.) And the presence of a crowd listening in here on Ocracoke will make a "silent statement". The first mate said to the captain, "Cap, the men need to see you." "Bring them up then," said the Captain. The men huddled around the Captain. 'Bring them up then,' said the Captain. The journey of the Windfall ll in one short blog. The sail was a glorious and brilliant expedition of five men: Philip, Steve, Frank, Captain Rob Temple, and Rob's son Emmet. Each day brought blue skies and different forms of landscapes from small towns to larger cities, from small water crafts to barges. The evening sunsets and night skies were of great beauty and awe-inspiring as they anchored. After dinner and the galley was clean for the night, the crew pulled out their fiddles, penny whistles and harmonicas. Their music and voices also sailed across the sea just as they did a century ago when sailing was an occupation. Morning coffee and sailing northward before the sun came up was the protocol as Captain Rob was always on the move. 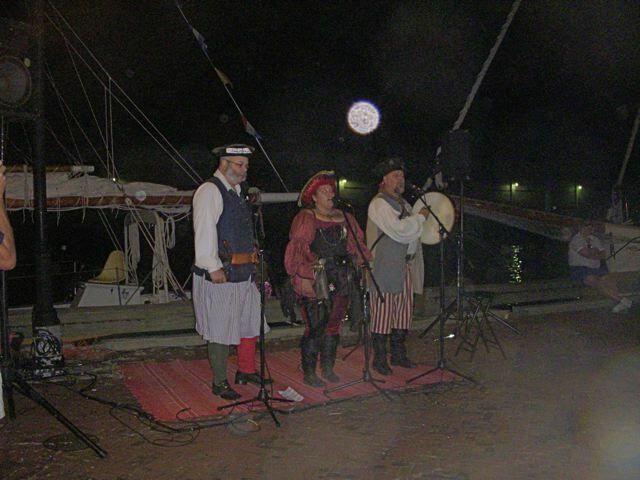 A week into the journey they were at the race site and greeted with music on the dock, festivals in the park, and a send off dinner with pirates and oysters. The day of the sail, dark clouds began to role in and rumors of gale force winds began to swirl about the 45 schooners in the race. It was definitely time to batten down the hatches and prepare for the 82 miles scheduled for the Windfall ll. As the race began, pouring rain slashed these old schooners with a rain every sailor dreaded since the beginning of time. In an interview with Captain Rob this morning at 0900 he said, "The weather was much worse than expected. 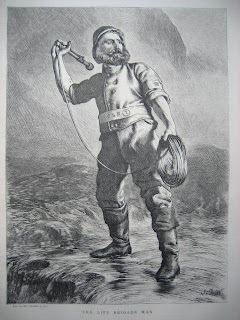 The gales in the night exceeded 40 knots and the darkness of the Potomac River made it so much worse." 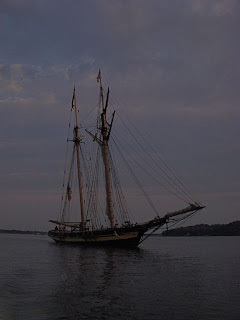 When the darkest of the night came, it was decided that for the safety of the crew and to keep the old schooner intact, sails would come down and a safe harbor would be found for a few hours. The men waited out the storm and then continued on down to the finish line. Cheers went up from the crowd as each schooner came into Portsmouth. Amazingly, not a crew member nor boat went down during the nor' easter than descended upon the men and women. After a brief conversation with Philip and Rob this morning, all is well...still drying out clothing and re-arranging the galley after the storm's winds tossed about their belongings. Sunny skies greeted them this morning as they begin their journey home to Ocracoke. 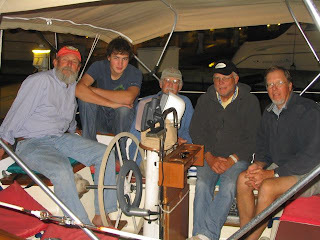 Needless to say, these men, these sailors of ours will have stories to tell for years to come about the Great Schooner Race of 2010. 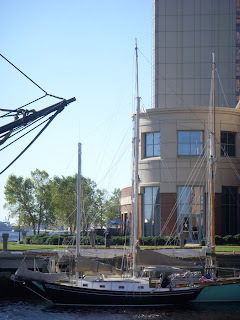 This is Lou Ann sending in the news from The Great Chesapeake Bay Schooner Race of 2010. All is well. Like peaches and cream, like love and marriage, like ice cream and hot fudge, people tend to think of the beach and summer as the natural combination. But having lived on Ocracoke Island now for three years, I've got to say I love it here in October. That October sky is SO BLUE! I guess it's the lack of haze and humidity. It's been in the 60's the last couple of days. The poison ivy leaves have turned red! And the beach! As Philip often says, it's different every day. Friday, for instance, there was a pleasant chop and light waves. There were a few people, some fishing, some reading, some with kids playing in the tidal pools and sand. There were lots of pelicans gliding along and diving head-first into the sea. And the beach was busy with sanderlings, willets and gulls. And there were literally piles of shells along the tide line. Ocracoke is not just about summer! This October at the National Storytelling Festival in Jonesborough Tennessee, Donald Davis received the Lifetime Achievement Award presented by the National Storytelling Network. Donald and his wife Merle are residents of Ocracoke. Donald conducts Storytelling Workshops here each June. That's how my wife, Lida, I first came to Ocracoke in 2000. We attended Donald's workshops for many years following that first year and eventually moved here in 2007. Donald is a master at helping us recall the memories of our lives and then shape them into stories that not only mean something to us, but will have interest to others. One of Donald's 2009 workshops was filmed and edited into a series of programs that will appear on some PBS stations beginning in early 2011. The series is called "What's Your Story?" Watch for it. It's not just about the art and power of storytelling; it's also about Ocracoke. Our latest Ocracoke Newsletter is the story of Ocracoke native Major General Ira Thomas Wyche. You can read the complete story here: http://www.villagecraftsmen.com/news092110.htm. If you missed this summer's Ocracoke Women's Arm Wrestling Championship (as I, unfortunately, did), you can watch it on Internet video. Just click on the link below (I just learned about this video). As many of our readers know, the arm wrestling was a benefit for our new radio station, WOVV, 93.1 on your local Ocracoke radio dial. A belated congratulations to "Karm the Arm!" 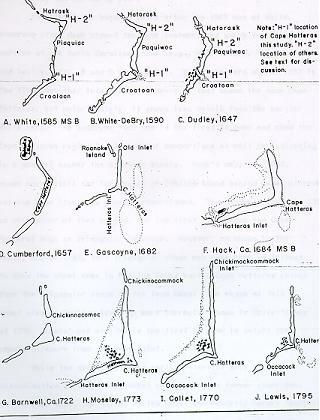 I recently came across this image that documents the changes in the North Carolina barrier islands from White's 1585 map to Lewis' 1795 map. Ocracoke Inlet is the only inlet that has been open continuously since Europeans have been keeping records. Amy took this photo a year or so ago. 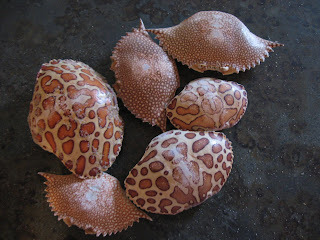 As we walk along the beach we often marvel at the beauty of these fragile but fascinating crab shells that wash up along the surf. ...is worth a thousand words! Sailors have for generations spent much of their free time at sea tying knots. There are a handful of basic knots -- the square or reef knot, the overhand knot, the sheet bend, the figure eight knot, the bowline, the half hitch, the clove hitch -- that are essential to know on a sailing ship. Many other knots are decorative. The monkey's fist is both decorative (small versions make excellent key fobs or lamp chain pulls) and practical. Members of the US Life Saving Service effected many rescues using the Lyle gun and breeches buoy. When shipwrecks occurred far offshore on the Diamond or other shoals the breeches buoy could not be used, and the rowing surfboat was employed. Once at the site of the wreck the life savers were frequently thwarted from approaching close to the ship by floating debris in a "seething mass of breakers." It was then that a "heaving stick" (a wooden stick about 12" long attached to a light weight hemp line, and with a monkey's fist knot on the other end) was used. The monkey's fist gave enough weight to the stick to allow the life saver to toss the device a greater distance. Once the heaving stick and line were on board the vessel, the sailors, one at a time, would tie the line around their waist and jump into the water and be pulled to the surfboat. 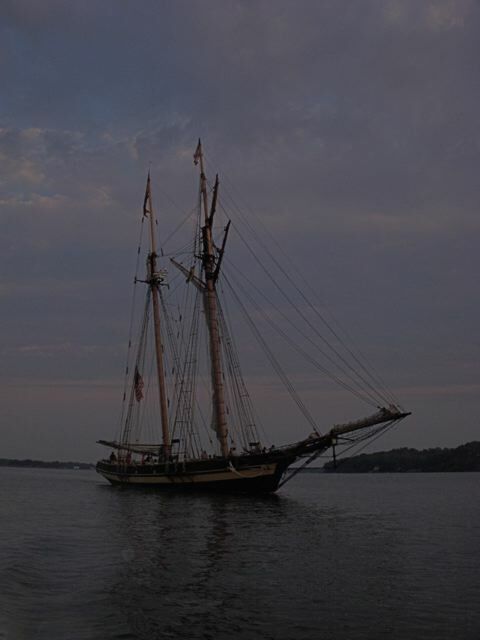 I will be aboard the Schooner Windfall II with Capt. Rob Temple as we sail out of Silver Lake harbor later this morning, on our way to Baltimore, Maryland. 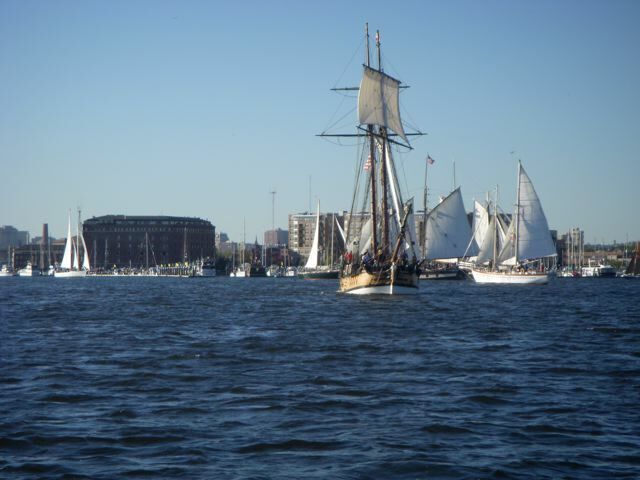 We will be one of almost four dozen schooners competing in the Great Chesapeake Bay Schooner Race October 12-16. 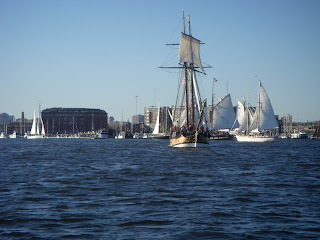 According to their web site (http://www.schoonerrace.org/) "The Great Chesapeake Bay Schooner Race (GCBSR) was founded to promote public awareness of the Chesapeake Bay's maritime heritage and to encourage the preservation and improvement of the Chesapeake's natural resources. 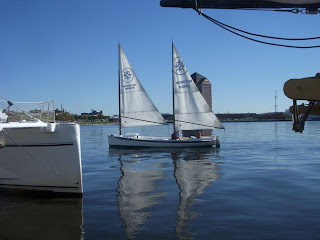 We accomplish this goal by donating the proceeds of the race to one or more charitable organizations involved in conservation of the natural resources of the Chesapeake Bay. To date, $137,624 has been donated to support children's education programs of the Chesapeake Bay Foundation. "The race begins in Fells Point, in Baltimore, Maryland, and ends 127 nautical miles down the Chesapeake Bay in Portsmouth, Virginia. Entry is open to all schooner-rigged vessels." 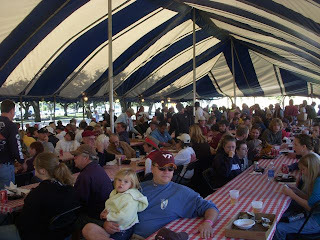 This will be one of the largest gatherings of schooners anywhere in the world. While I am gone Jude Brown and Bill Jones will be helping to keep you up to date about daily life on Ocracoke Island. The soil in my front yard is poor, to say the least. During WWII the Navy dredged Silver Lake harbor (Cockle Creek to locals) in order to create a basin deep enough for their vessels. In the process the spoil was pumped into the village. Much of it went into my yard. Although it did elevate my property, the sand has few nutrients. I have introduced a few decorative plants, but they are not really thriving (I'm also not much of a gardener). However, just the other day I noticed that there is one bloom on my Knockout Rose. I thought I'd share it with you! "Hatteras-Ocracoke ferry route is running on the hour today [Monday, Oct. 4, 2010]. There is still dredging going on in the inlet." the Motor Vessel Cedar Island. · The 8:30 p.m. run from Cedar Island to Ocracoke. center at 1-800-BY-FERRY to make alternative arrangements. I was recently alerted to a short video from ABC News, their "Going Home Series" about fishermen from Hatteras Island who help feed the elderly and infirm with donated fresh fish. On Friday a reader asked if I have ever lived off the island. Yes, I have, although Ocracoke has been my home for about 40 years. My dad was born on Ocracoke, and this was the only place we ever came for our summer vacations (other than one year to visit Ocracoke relatives in Massachusetts, and another year to visit Ocracoke relatives in Florida). I grew up near Philadelphia (like most island men of his generation, my dad moved to Philly to work on dredges & tugboats), graduated from Gettysburg College (where I lived for four years), spent the 1968 summer in Las Vegas, New Mexico, and the rest of that year and the following winter on Rocky Boy's Indian Reservation in north central Montana (the temperature one morning was 52 degrees below zero, not counting wind chill!). I taught school in Maryland (Sandy Spring Friends School) for a couple of years, and spent several months living with a family in Quezaltenango (Xela), Guatemala. Every place has its own charm, interesting history, and unique culture. And Ocracoke is one of the best! 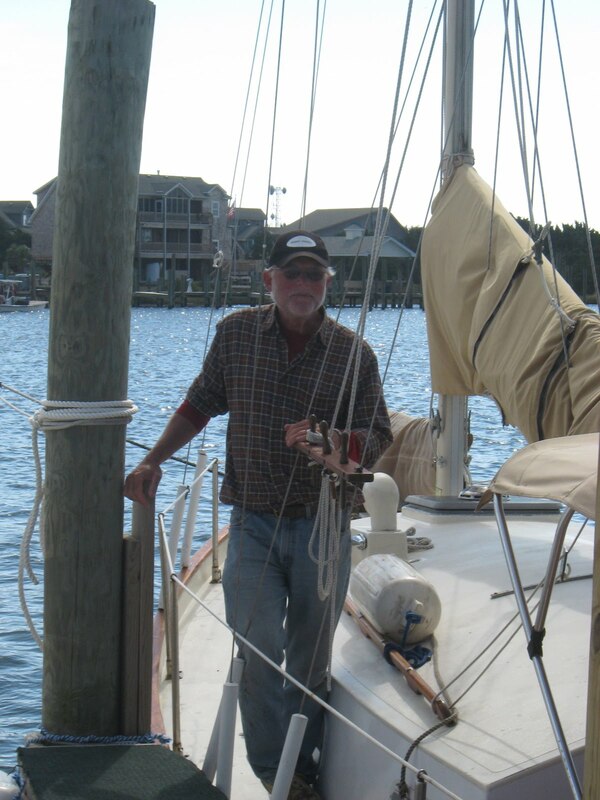 Many of our readers have sailed with Capt. Rob Temple aboard his former schooner, Windfall. This past spring the Windfall was dismantled, and Rob purchased a replacement vessel, the Windfall II (this is the boat we took to the Great Chesapeake Bay Schooner Race last week). Our good friend & craftsman, Jim Goodwin, has made a couple of special Windfall models that are mounted in bottles. They are constructed from portions of the original schooner, and are offered for sale at Village Craftsmen. There is a very limited supply of these models (and we have no idea if we will ever get more). If you would like more information about them, or if you would like to place an order, please click on the photo or the link below. If you are interested, please remember, they may not last long. 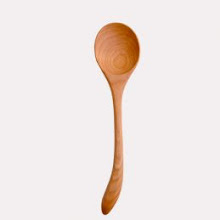 Only those described as "wood from the schooner" are actually made from the original boat. MANNS HARBOR — The North Carolina Department of Transportation’s Ferry Division announces that extreme shoaling at Hatteras Inlet is prohibiting operations from resuming on the Hatteras-Ocracoke route. The Ferry Division is working with the U.S. Coast Guard and other agencies to find and mark a new channel, which may take as long as two days. Once a clear channel is found and marked, the Hatteras route will return to normal operations. All other routes are operating normally. The Ferry Division is waiving tolls for Ocracoke residents and commercial supply vehicles today. Residents must show proof of residency in the form of a driver license and will be given priority re-entering the island, however, they must arrive at Swan Quarter or Cedar Island 30 minutes prior to departure. Tolls will also be waived for Ocracoke residents leaving the island, but no priority status will be given. Residents must get in the stand-by lane and arrive 30 minutes prior to departure going to Swan Quarter or Cedar Island. Reservations are being honored as well. For up-to-date information, call 1-800-293-3779 (BY-FERRY) and Press 1, or go to www.ncferry.org. 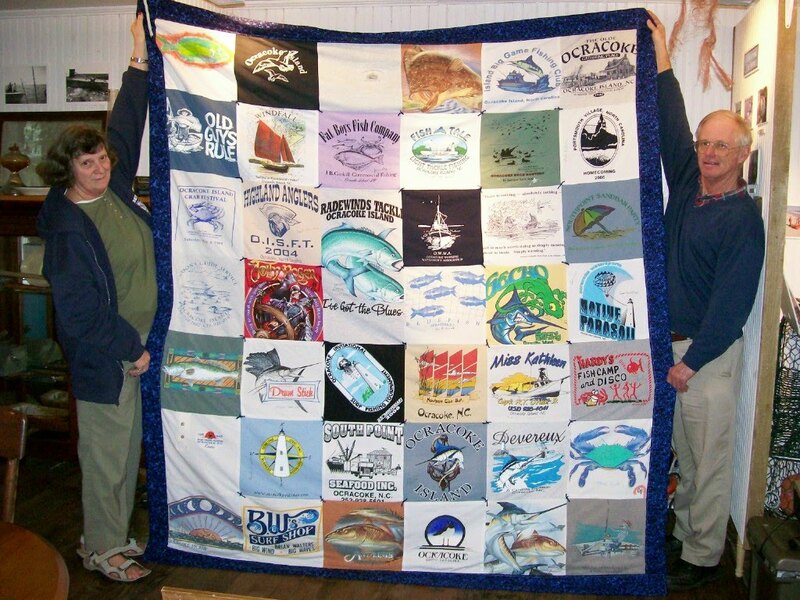 Several weeks ago a reader inquired about the quilt raffle in support of the Ocracoke Working Watermen's Association. 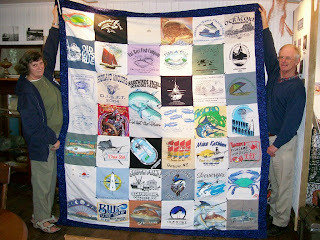 This was the quilt made by Joyce Reynolds, our former Methodist preacher, from fishing & water-related Ocracoke t-shirts. The drawing was held on Labor Day, and island fisherman Morty Gaskill drew the winning ticket. The Klein family from Gretna, Louisiana won the quilt. According to Robin Payne, when contacted they said, "Thank you. 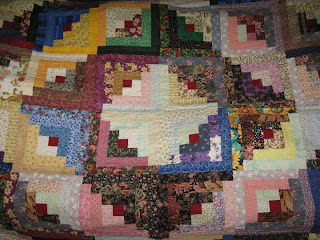 It is a beautiful quilt and a wonderful cause. We love Ocracoke and we will cherish this symbol of it in our families." About an hour ago I heard that there may be a navigable channel for the Hatteras Inlet ferries, but they can't use it until the US Army Corps of Engineers inspects and approves it, and the US Coast Guard moves the buoys. Word is that they expect the channel to be approved and marked sometime later today or tomorrow. Remember, this is simply the word on the streets of Ocracoke...not an official report. This may not be accurate. Please check the NC Ferry Division for official reports. I thought our readers might like to know the latest talk about ferry service to Ocracoke. Please keep in mind that this is not official news...just what I've been hearing at the bank, stores, and post office. I understand that the dredge operating in Hatteras Inlet clearing the channel for the ferries has had some problem, and is for the time being unable to open the channel (it was silted up from this recent tropical depression). Consequently, the Hatteras Inlet ferries are not operating (at least that's the talk around the village). Please check with the NC Ferry Division for oficial reports and updated information. The last word I received is that the Swan Quarter & Cedar Island ferries are operating. The wind blew a gale most of the day yesterday. I went down to the dock several times to check on my boat. About 5 o'clock in the afternoon the wind nearly knocked me off the dock. I'm guessing it was gusting to 50-55 mph. There were periods without any rain...and then the heavens just opened up, and rain poured down as from buckets. The ferries did not run all day yesterday. I am writing this just after midnight, so I don't know the situation at daybreak Friday, but the forecast is calling for winds of about 20 mph, so I'm guessing the ferries will be back in operation. As far as I know, we didn't have any tide in the village. If you're traveling to or from Ocracoke it would be a good idea to check highway conditions on Hatteras, Swan Quarter and Cedar Island.